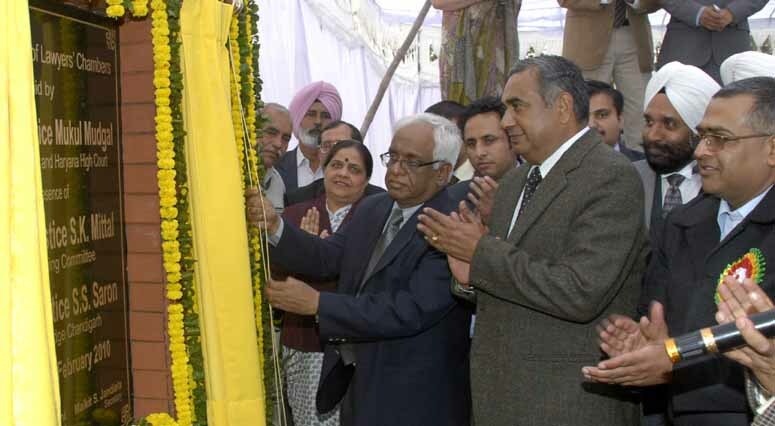 By Sanjay Pahwa : 1 March , Chandigarh : Chief Justice of the Punjab and Haryana High Court Justice Mukul Mudgal laid the foundation stone of the lawyers’ chamber complex at New District Court in Sector-43. He urged the Chandigarh administration to provide an uninterrupted motorway from the Punjab and Haryana High Court till the district courts. Mukesh Mittal, President, District Bar Association told on this occasion that five-storied building would be completed within a year. It would have 440 cabins, and three members would sit in a cabin. Member of the bar Association thanked Mukesh Mittal for taking this initiative.